Club Hotel Casino Loutraki showcases an exciting architectural design and is contemporary throughout. The beautiful grounds of the hotel incorporate a series of pools and fountains creating a unique setting. With three restaurants, an infinite variety of services, and the largest gambling casino in the country, this is a one-of-a-kind resort. 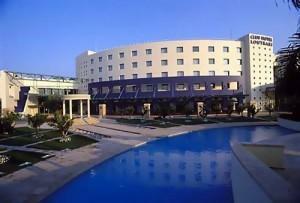 Club Hotel Casino Loutraki has 255 luxury guest rooms and 20 luxurious suites. Standard rooms have air conditioning, color satellite television, direct-dial telephone, mini bar, safe box, and private bath with hairdryer, slippers and bath amenities. Sea view rooms also include a sitting area and outdoor balcony. There are three restaurants on the premises, with the main restaurant, the Deep Blue, offering a buffet breakfast, lunch and dinner, with both indoor and outdoor seating. The a la carte Aquarius offers gourmet Italian cuisine, and the Oceanos features fresh seafood and sushi. Throughout the complex and at the pool and on the beach, there are seven bars offering drinks and snacks, one of which operates 24 hours-a-day. The hotel's Spa offers a full spa treatment program, including nail salon and indoor pools. You'll find swimming pools, specially-designed pools for children, a lifeguard in attendance, water sports at the beach, and a full program for children. Hotel services include an Internet Corner, 24-Hour Reception, shopping arcade and hair salon, plus 24-Hour Room Service. The hotel's impressive conference facilities can host up to 1000 delegates. Adjacent to the hotel complex is the magnificent Casino, the largest in Greece. It has its own restaurant plus 80 tables and 1000 slot machines covering three floors, and operating 24 hours-a-day. The hotel is situated at the sandy/pebbly beach of Loutraki, the famous ancient spa, a 45-minute drive southwest from Athens International Airport.